Today we’re going to learn how to grow tobacco, how to cure tobacco and even how to make pipe tobacco at home. For the last few decades, we’ve been told smoking is the cause of everything from lung cancer to heart disease. There doesn’t seem to be any middle ground in this debate. If you’re a smoker, you’re an outcast… a pariah… a Very Bad Person. However, the truth about smoking isn’t nearly as cut and dried as you might think. Did you know that lung cancer rates rose even as smoking declined? Or that some studies showed longer life expectancies for pipe smokers than for non-smokers? Wherever you fall on the smoking spectrum, there’s one thing that’s sure: smoking isn’t going away. And this presents an opportunity for the hard-core prepper. A lot of folks need their daily nicotine. Business gurus will tell you that meeting needs is a great way to profit. Though you can’t legally sell your own homemade cigarettes right now, there may come a day when regulations fly out the window and the free market takes over again. Even if it doesn’t, being the guy that has what people need is a great place to be. Imagine shipping gets shut down, or the cost of tobacco shoots to the stratosphere due to regulation or the rising cost of fertilizers or any of a number of reasons. Even if you’re not a smoker, having some tobacco around could be very useful. Say you have a nice tobacco patch in your yard that you grow each year. Your friend needs a smoke really bad. You want help on a fence, you trade him some leaves and bingo: that tobacco patch has paid for itself. Alright… because you asked so nicely… and because I’m hungry… and because .22LR is roughly equivalent to gold bars these days… I’ll help you start growing your own tobacco. Growing tobacco in a raised bed. Growing tobacco is pretty easy. I’ve grown tobacco for almost a decade in my home garden. Though my method may not be the best, it works well for me and has been tweaked over the years into a pretty fail-safe operation. You need a few things, but all of them are really easy to find (with the exception of seed). To get started, you need seeds or transplants. If you live in tobacco country, you might be able to buy some transplants locally; otherwise, you need to seed your own. Unfortunately, starting tobacco from seed isn’t the easiest thing in the world – yet it’s not as tough as you might think. Tobacco seeds are even smaller than poppy seeds and will get you in less trouble. A pinch of them contains hundreds of potential plants. Because of their minute size, they need to be planted differently than most other seeds. To add an extra layer of fun, they also need light for germination – and when they do germinate, the seedlings are really, really tiny. This is why it’s really difficult to direct-seed tobacco in your garden. Chances are, the sun will wipe your plants out before they develop into anything – even if you have a totally perfect little – so instead of planting them right in the soil, it makes sense to start them in carefully managed flats. These flats can be made from just about anything. I used to use egg cartons but I found that the soil in them dried out too quickly so I switched to using home-made wooden flats that are about 4” deep. To plant tobacco, prepare a fine soil surface in your flat or container, make sure it’s good and damp, and then simply sprinkle the tiny seeds across it. Mist your seeds with your spray bottle, and make sure the flats are in the shade – if they’re not, you may dry out the soil and kill the plants before they emerge. In about 10-14 days, you should see tiny seedlings begin to emerge from the soil. They’re so small you almost need a magnifying glass to see them at first. Within a week or two, your tobacco seedlings will get bigger – and in a month or so, they’ll likely be an inch or so in height. As the seedlings grow, I thin out the flat with a pair of scissors, decapitating unwanted plants rather than pulling them out and disturbing the roots of their neighbors. Give each little plant its own space and their growth rate will be much higher. When your plants get about 2-3” tall, transplant them to a second flat until they’re large enough to transplant – or, if your weather is mild and the sun isn’t too brutal, put them directly out into the garden. I usually wait until they hit about 6” before placing them in the garden, but I’ve had good luck with smaller plants as well. Once tobacco is transplanted, it grows really fast. Feed it compost, manure or whatever you have available. I’ve had them do okay in poor sand, but they do amazingly if they get a little more care. In a couple of months, your plants will be huge. At this point, you can start picking nice leaves. Watch out for hornworms, though – they’ll take a tobacco plant to pieces really quickly. Other than those, you’ll deal with minor pests like aphids, but overall, I don’t get too much loss. If leaves get chewed up, they go in my “pipe and cigarette” tobacco pile, if they’re broad and intact, they go in my “attempt to make cigars again” pile. After a few months, depending on your climate and average temperatures, your tobacco will burst into bloom. 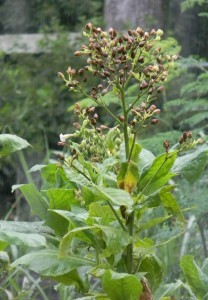 Each one of these tobacco seed pods contains enough seed to plant your entire yard. The flowers are pretty and resemble their cousin the petunia. Commercial tobacco farmers remove the buds to force larger leaf growth, but I keep them for seed and because, well, they look nice. For an in-depth video on growing tobacco, I made a couple of years ago. However, it all depends on what you’re looking for. If you want a smoke, all you need to do is dry and smoke the leaves. I used to park my car in the sun with the windows cracked open and spread leaves all across its dashboard. One afternoon in the sun and they were nice and crispy. If you’re used to the taste of cigarettes, know this: that taste isn’t what raw natural tobacco tastes like. It’s a product of factories and flavor sprays and special blends. The taste of raw tobacco is smoky, grassy, biting… and yet still enjoyable. If you’re more of a cigar smoker, you may not ever be happy with your homegrown smokes. Curing cigar tobacco is an art, much like wine-making. It can most definitely be done, but it’s beyond the scope of this article. 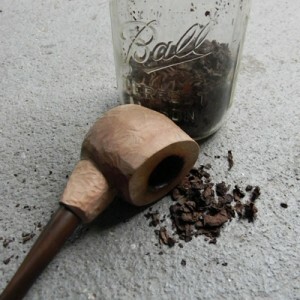 Let’s look at how to make pipe tobacco at home like a redneck. I’ve found it’s possible to make a pretty good Latakia/English pipe blend imitation by taking dry leaves, soaking them in water and molasses, then putting a basket of them in the smoker for a day. I used hickory chips, which I’m sure is totally wrong, but it tasted great. Like smoking a pipe of beef jerky. After taking the whole leaves from the smoker, I cut them into little bits with a pair of scissors, then let them dry to a good smokeable moisture content. Not bad at all. If you’re more of a “Captain Black” smoker, you’ll have to look around for pipe tobacco flavoring – I haven’t been able to make a decent aromatic blend from my homegrown leaves, though I’ve used black cherry juice concentrate, vanilla and other experimental flavorings from my wife’s collection of spices. Speaking of spices, if you like smoking cloves, you’re in luck. A decent clove mixture can be made by simply taking dried tobacco, sprinkling it with ground cloves, then rolling that in your wrapping paper of choice. Been there, done that, got a numb mouth. Note: the leaves I used were way too dry and shredded – this will work a lot better with bigger leaves instead of shreds. Yes, it’s true that tobacco has earned some of its deadly reputation – yet if you really want to talk about a health crisis, you should talk about sugar/high-fructose corn syrup and obesity. The very people that often condemn smokers don’t seem to realize that their diets of processed foods and Coke aren’t any better than putting away a few packs of cigs a day. The key, as always, is moderation. Growing your own tobacco without pesticides and not adding weird additional chemicals in the processing phase is a pretty good way to minimize risks. It’s ORGANIC, for goodness sake. And we KNOW organic is good for you, right? Yeah, I know. I’m very sorry. What is your favorite seed varieties? I've been growing a small-leafed "Havana" cigar variety for years now, but I'd like to expand into the huge-leafed burley types. The flavor on what I have ages out very nicely… dunno how the large types will compare. I need to keep experimenting. Good link. I think that's where I got my original tobacco seed years ago. I grow a dark and a light Burel (Sp?) every year. Some years I don't even bother to start my own as I often get many volunteers that have been cross bred from the two varieties I started with. As you mentioned the curing process is the hardest part especially when trying it in small amounts. I have been working on a fermenter set up that uses some heat from my wood furnace but have had issues figuring out the moisture retention issue. Even if you do not cure your own tobacco the plants are amazing at acting like a trap for hornworms. Either variety (Tomato or Tobacco) hornworm will go straight for the tobacco plants and leave my tomatoes almost untouched. My assumption is the moths prefer the tobacco to lay on over the tomatoes but the worms are much easier to find on the tobacco plants. I have also had good luck mixing my cured tobacco in with store purchased varieties which extends my supply out by almost 100% at times without sacrificing too much flavor. Great ideas and input, PioneerPreppy. I've also noticed how much hornworms like the tobacco. Heck, I've considered drying and smoking the worms just to get back what they ate. Curing is the big deal. I haven't pulled off good cigars, though it's on my list of things to do before I die. 1. The truth about smoking is cut and dried(pun intended). 2. Sure, there's middle ground in the debate. Lots of people don't think that smoking make a person "very bad". Some just think that smokers are weak spirited and are engaged in a destructive habit that will lead to premature death and a loss of "quality of life" in their final years. Some people might be disappointed that a professed Christian would encourage what they consider sinful behavior. Some couldn't care less. 3. Why would any sane person waste perfectly good garden space to grow tobacco when they could plant grapes or corn and make booze. Grapes go bad, and wine takes years. However, in a SHTF situation, a small jar of rolled stogies can be worth a fortune. Cut and dried? I don't think so. Lung cancer rates continue to increase even as smoking has declined. Plus, cigarette smoking isn't the same as pipe or cigar smoking. It's like saying nachos are equivalent to fresh corn on the cob… yet they all get lumped in together. Those who think smokers are weak spirited or engaging in a destructive habit that's going to kill them are free to feel thus… just as smokers are free to point out that most of the Standard American Diet is more likely to kill you than cigar smoking. As for the spiritual angle, I'm with Spurgeon. Smoke to the glory of God… and thank Him for tasty tobacco. On #3… you do have a point. The lesson is: make more garden space, then you can have it all. Lung cancer rates can increase while smoking rates decrease because current lung cancer rates do not reflect current tobacco use. They reflect past trends in tobacco use because the ill effects of such use don't normally show up until years after a person starts smoking. Lung cancer rates are also affected by other environmental factors, such as exposure to exhaust fumes or occupational exposure to carcinogens. On an unrelated note, are you experiencing "greening" on any of your citrus? Thank you for your informative and thought provoking blog. "the ill effects of such use don't normally show up until years after a person starts smoking"
I don't buy that. Smoking has dropped for years and years… long enough that the data should show significant declines in lung cancer. Also, doctors calculate "smoking deaths" by determining if a deceased patient smoked at any point in their past. If so… smoking-related death. Spurgeon's real problem was food (like most Baptists). As for greening, I don't seem to have it here, but I did have to take out my mom's navel orange down south. Smoking death calculation is rather like alcohol statistics. If you and I are traveling, you are driving, and I had a beer before we left, if you have a fender-bender, and the police note that your passenger had a beer, then it gets marked an “alcohol-related” accident. Twain has thoughts on that sort of thing. should i do anything to enrich my sandy Florida "soil" (really, it's just sand here) before transplanting young tobacco plants into the ground? and is peat moss ok to start the tobacco seeds? Peat moss isn't the best. Sand is good enough and a not-to-chunky potting soil is another good option. I plant tobacco directly in into the ground here and fertilize them with chicken manure or compost or whatever else I have laying around. It's pretty tough stuff. If you want an easy cure method. Lay your mature leaves on the grass in a pile. Cover with a damp towel or sack. Turn the pile inside out every day for about 5 days or until a uniform colour of yellow or brown has taken place. Some leaf might turn brown while others are still green. Remove the brown or fully yellow leaf and hang it in the shed to dry. Once dry, smoke away or store it. It tastes quite good at this stage although it’s better with age. Phil – this is great information. Thank you. How do you prevent mold? My leaves mold unless they are completely separated. In drying or when on the plant? After picking. It seems it only takes a few humid days and they start molding. I tried hanging the entire plant in my woodshed. Lots and lots of mold. Let them sun-dry first, then hang them up. That’s made a difference for me. Thats the same technique I use. Then when they yellow, i remove the stem by making a loop of thin wire and run the stem through it ti cut the keaf away from the stem. Works great! For sprouting seeds, I found that laying a single thickness layer of paper towel right on top of the soil after sowing the seeds works great. It makes a barrier to reduce drying, and is thin enough to let a bit of sunlight through that they need. You water by spraying on the paper so you don’t disturb the seeds or tiny sprouts. Once you have plants big enough to see easily, you take off the paper. Another helpful trick is to inundate the soil with boiling water before planting. This kills bugs, mold, weed seeds, bacteria, and the tobacco gets a really nice healthy start. Let the soil cool a bit before sowing, obviously. I plant the sprouts when they are about 2 inches tall. The great majority survive. They need to be watered occasionally until they are established. Great input – thank you. I’ll have to try the paper towel trick. David, thanks for the great article on tobacco! I agree with your response to Anonymous #3 – grow tobacco, grapes and corn….have it all!! ha ha Seriously though, your article is very informative!! Thank you. Prefit | You’re subscribed to discussion of How To Grow Tobacco and Why You Should Grow ItThank you!!! “Step up. Make it Right.” Mike Holmes Be part of the solution!!! Sent by an awesome binary carrier pigeon! My sprouts look great so far. I planted them in early February, and now they are about a quarter-inch tall! The room I keep them in is always quite chilly, under 60 degrees which really slows them down. Germination is great, better than usual, I think because I used my own seed that I had just picked in the late fall, so it was very fresh. Store-bought seed can be hit-or-miss. The paper-towel trick worked great, but then, the excess seeds I just scattered on the top of various pots also sprouted well. I suspect that if your seed is good, tobacco isn’t nearly as finicky as people say. As soon as all risk of frost is gone I’ll take them outside. That’s when they really take off and start growing. Transplanting when just a few inches tall was fine last year. I believe that my grandfather died at 93 (Alzheimer’s) after a lifetime of smoking as did my ex-father-in-law at 91 who smoked non-filters till the day he died (dementia) because they simply did not get wrapped up in all the fear mongering by the media. In fact, I believe most diseases are at least partially due to fear of everything they eat, drink, smoke, or touch too much. Fear is the number one exacerbator of dis-ease. People need to stop buying into the huge market for all the cures for old age and ill-health, and stop being moved by what somebody else thinks. This is not to say that any specific behavior is okay or healthy, just that, as Jesus said, “It is not that which goes into the mouth of a man that defiles him, but that which comes out. Blasphemy, adultery”…etc. Yep, words and ideas. What you say, which is what you think, is of far greater import than substances. There’s my sermon for the day. Bless you all. This is the best tobacco growing post I’ve seen yet–thank you! Definitely adding it to my garden next year. Thank you, Jesse. I appreciate it. Fun read, thanks for sharing! Enjoy smoking cigars, but have been considering picking up pipe smoking. What better excuse than growing your own and tobacco and realizing that it is way to hard to make a cigar from them. Yes – the pipe tobacco is tons easier. I STILL can’t roll a cigar! Hello sir! Fellow piper here! I have tried to quit nicotine for some time and have realized, by growing tobacco you will A: get nictotine in you B:get a sense for how much work is behind supporting your drug use. I have sworn never to inhale again! thus, picking the pipe up again ^^. I have fermented my first leaves for some time(3 weeks) and today is the day I shall taste the fruit of all my labour :), they just have to reach proper moisture content. I want to tell you something about american chew… its bad for your teeth, all that sugar + fermentation bacteria = bad………………………..
Nice information you have here thou! I enjoyd reading it! Puff on fellow Dragon! Snus sounds very good – I’ve never tried it but will look it up. Good work with the fermentation! Excellent! I would love to hear how it turns out. Inhaling any combustible material is never going to be “healthy” for anyone. However, if you choose to do so you should grow your own. But if you’re going through the effort, you might as well just grow weed instead.